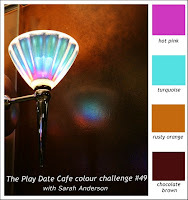 It's time for another wonderful color story at The Play Date Cafe - this weeks color story (Hot Pink, Turquoise, Rusty Orange and Chocolate Brown) comes from Senior Designer Sarah Anderson. This week the PDCC is being sponsored this week by Pat Huntoon from The Technique Junkie Newsletter. A little about the Newsletter....the TJNL is published every-other month, featuring 15 or more stamping techniques in step-by-step format. Each technique has a corresponding pictorial online, and a full page of inspirational artwork. To date, over 600 Techniques have been published – by far the largest and most extensive library of rubber stamping tutorials available. This weeks prize: a three-year online-only subscription to the TJNL. The winner will have online access to the 2009, 2010 and 2011 issues, a total of nearly 300 Technique Tutorials by the end of 2011. (Value $29.95) Pat is also offering PDCC readers and participants the 2010 and 2011 issues (online only version) for only $18.88. That is 180 techniques – for less than 10¢ a technique. Just mention this special when you order! And here's this weeks Color Story Photo. We'd love for you to play along with us at the Cafe, you can find all the details here on how to enter. If you upload to any online gallery please use keyword PDCC#49 so we can find your creations! Love how you incorporated all the colors in your project and it's a great design using the clipped corners technique. Wonderful birthday card and beautiful. Love the details you added. 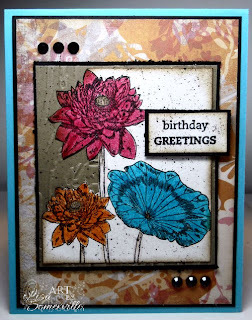 including the speckled background on the flowers and the texture behind the clipped corner. What an awesome effect!!! Beautiful card Lisa! Love what you did with this technique! 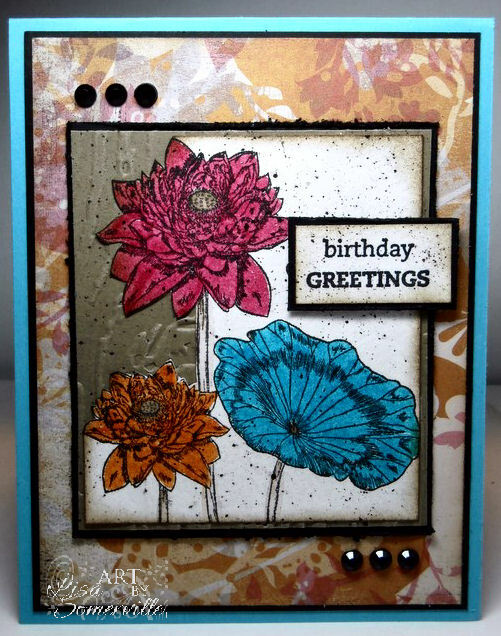 Beautiful card - love the colors you used! Beautiful card, love the colors of those flowers with the background paper and the clipped paper technique is perfect with those bold flowers. Great job with the challenge. Absolutely gorgeous, Lisa. I subscribe to TJ so I hope I get my issue soon to learn that technique. Love how you've done the clipped corner technique Lisa and the way you've used the colour story! Excellent use of the technique Lisa, you've got it down! Love the distressed look, gives it a chic look! Super work, as usual!